After a quick trip to Louisiana to harvest end-of-season limes and now-ripe satsumas from our citrus trees, we drove up to Dallas, TX to visit grandchildren. While in Dallas, I perused recipes in various community cookbooks I found in my son and daughter-in-law’s cookbook collection. Two things I learned from reading through their Texas cookbooks was that even hot-weather Texas grows apples and Texans have a tradition of making apple pastries and cakes; as learned from the state’s German settlers. In the morning, I made an apple crisp with an assortment of Honeycrisp, Golden Delicious, and Granny Smith apples. Later in the day, I decided to make something that would satisfy my desire for an earthy tasting, not-too-sweet salad. I wanted to combine the fruits I had on hand, the apples and satsumas, so I thought about what dressing and other ingredients would minimize the sweetness of the satsumas. Satsumas are seedless, thin-skinned mandarin oranges. The small oranges are easy to peel and section and mix well into salads. Rummaging through their cupboard, I found walnuts, raisins, cane syrup, and apple cider vinegar. In the refrigerator was a box of baby spinach leaves from Whole Foods. From available ingredients, I prepared a modified apple and raisin salad. Instead of a creamy mayonnaise-based dressing, I topped the apple, raisin, and nut mixture with warmed tangy vinaigrette and tossed in chopped satsumas to add a hint of juicy sweetness. The fruits were spooned over torn spinach leaves and served in stemmed glasses. Pretty good tasting, I’ll make the salad again to serve with pork or roasted turkey. Whisk together vinaigrette ingredients, cane syrup or molasses, apple cider vinegar, vegetable oil, mustard, and dash of salt in a small bowl. Set aside. Peel, core, and chop apples into bite-size pieces. Melt butter in a sauté pan. Stir in apples and heat over low to medium heat until apple chunks are slightly softened. Add raisins and walnuts and continue heating until raisins are plumped. 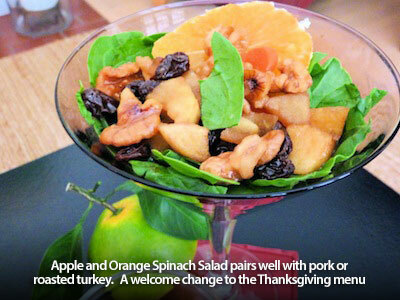 Pour vinaigrette into the warm apple, raisin, and walnut mixture. Heat for a minute or two just to warm the vinaigrette and allow it to coat the apples, raisins, and walnuts. Tear baby spinach into pieces and arrange on serving plates or in glasses. Spoon warmed apple, raisin, and walnut vinaigrette over the spinach. Lightly toss in chopped satsumas. Garnish with a satsuma slice, if desired. Serve immediately.